Think you know Coal Vines? Think again. With the February 2015 addition of Chef Angelo Landi, Coal Vines is an entirely different beast. Now, don’t get me wrong, Coal Vines still offers the incredible pizza that we all know and love but under the direction of Chef Landi as Corporate Chef, they are truly working on revamping their image. In years past I always described Coal Vines as “that place with great pizza but horrible service” and thanks to the recent changes, it is now in my book as “that place with great pizza, great service and I can’t wait to go back..how’s tomorrow?”. Something that Chef Landi is really focusing on is “The Board,” meaning specials that rotate depending on what is fresh and looking good that day. He tries to get produce as local as possible and if it doesn’t look good, it’s going back to the vendor. A subtle yet noticeable effort. 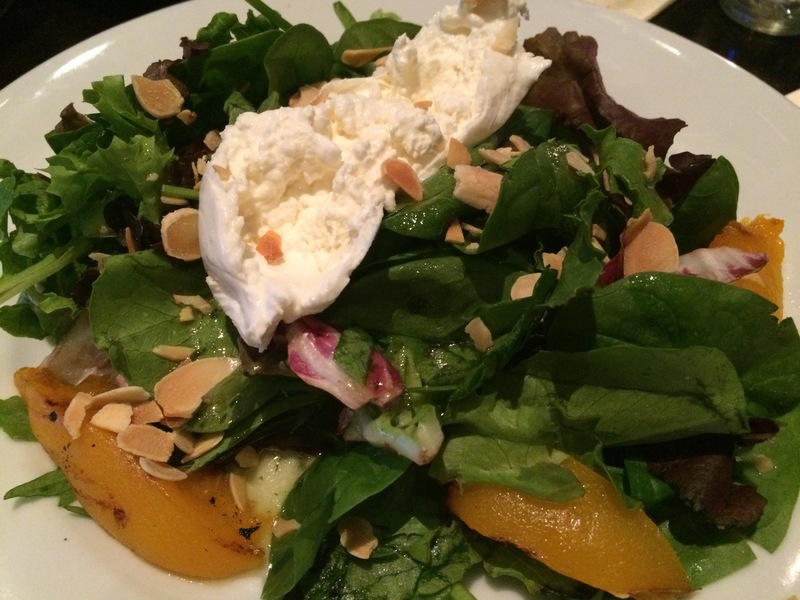 On the particular evening that I visited, I wanted to order approximately everything on the board but knew I also wanted to shove my face with lots of pizza so I settled for just ordering one of the specials, The Grilled Peach Salad with Marcona Almonds and Burrata because….um, DUH. Yes, it was as delicious as it sounds, in fact, maybe it was even more delicious. Before I could even take a sip of my Dr. Loosen Riesling my dining partner had murdered her plate and the salad was nothing but leftover splotches. Thank goodness I snuck a bite in while she wasn’t looking. 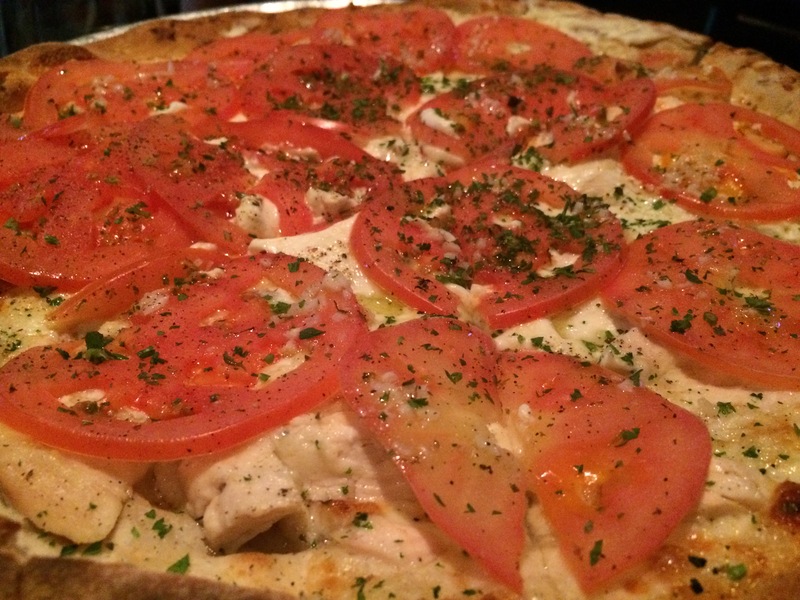 It’s hard to describe just how delicious Coal Vines pizza is. It’s the sort of thing you go out and get all gussied up to go eat but secretly wish you were in your PJs eating it in bed so nobody was judging how many slices you actually are eating. During this visit we went with the White Special (add chicken) which is mozzarella, ricotta, parmesan, sliced tomatoes and fresh garlic and it was fantastic. It’s the kind of pizza that is easy to fold and doesn’t flop apart, making it easy to hoover it into your mouth…which obviously is my favorite hobby. Not that we needed it, but Chef Landi insisted that we try the Tartuffo, a traditional Italian dessert originating from Calabria, and who in their right mind would turn dessert down? Although it looks heavy, this dish managed to be surprisingly light with being indulgent at the same time. 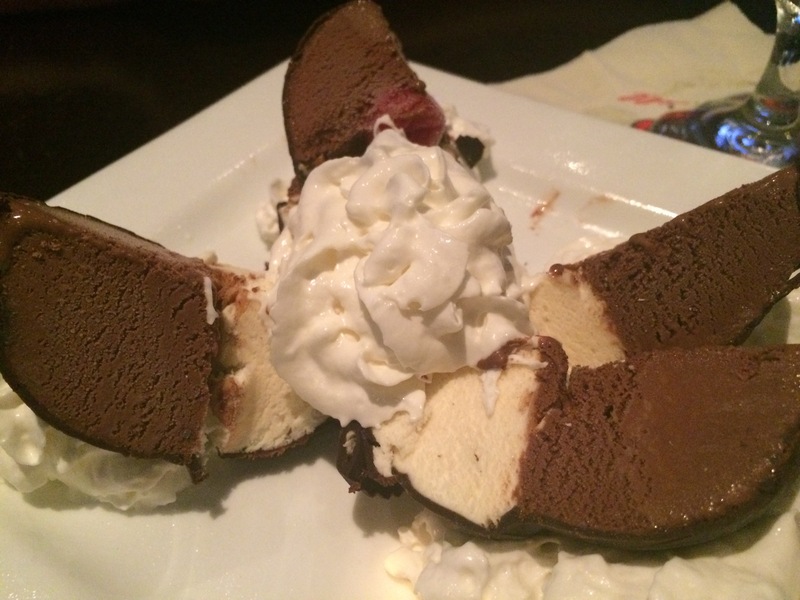 Let’s get real… a chocolate casing around ice cream….nothing about that could be wrong. Be sure to save room when you visit to end your meal on a sweet note, their Heath Bar Cheesecake was incredible, too. I am so happy that the nice folks behind Coal Vines invited me in to revisit what they’re all about, I left with a totally new opinion of them. They have lots of fun plans in the works, including the mid-September opening of their new location inside the Omni Hotel Downtown, so be sure to stay tuned and with a pair of fresh eyes in the mix, it’s sure to be a success!